Atria Books/Beyond Words, 9781582705095, 304pp. Bestselling authors Christine Arylo and Amy Ahlers show women how to take their self-bullying Inner Mean Girls to reform school with their internationally recognized seven-step program. There is a silent epidemic spreading like wildfire among women—and no one seems to be talking about it. It’s in our boardrooms, classrooms, and living rooms on every continent, and it’s creating depression, stress, and isolation. Who is this culprit? Meet your Inner Mean Girl, the judgmental, critical, and belittling inner bully that almost every woman hears running through her mind on a daily basis. The Inner Mean Girl creates undue anxiety, cajoles you into making bad choices, and then berates you when they don’t work out. But there is a cure. Reform Your Inner Mean Girl introduces the universal seven-step program that helps women transform their relationships with themselves from self-sabotage to self-love. 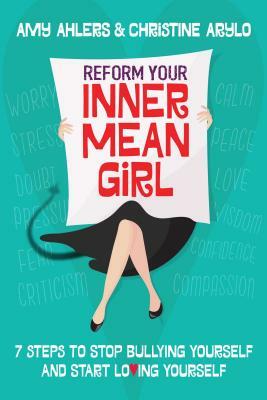 With a mix of play, humor, creativity, and self-inquiry, Reform Your Inner Mean Girl transforms a woman’s self-bullying thoughts, emotions, actions, and feelings, and helps her get in touch with a much more powerful voice—her Inner Wisdom. After graduating, women can finally make choices that create more happiness, peace, love, and success. Christine Arylo is a transformational teacher, internationally recognized speaker, and bestselling author of Madly in Love with ME and Choosing Me Before We. After earning her MBA from Kellogg and climbing the corporate ladder for fifteen years, she chose to devote her life to creating a new reality for women and girls, one based on self-love and true feminine power instead of the relentless pursuit of having to do, be, and have it all. Christine has worked with Gabrielle Bernstein, Kristine Carlson, Marci Shimoff and Chistine Hassler. She has been featured on CBS, ABC, FOX, WGN, E!, Huffington Post, BeliefNet, and The Daily Love. She lives in Oakland, California, with her soul partner. "Read this book and change your life. It will explain who your Inner Mean Girl is, why she acts like she does, and how tot ransform her into a self-compassionate inner guide." "Amy and Christine are without a doubt the real deal when it comes to helping women to break free of the self-sabotaging voice of the inner critic. They are masterful!" "The Inner Mean Girl work is essential to the development of the feminine psyche. many books have been written about how to navigate the inner dialogue of women, so why are we still so hard on ourselves? This book hold the key to unlock that mystery. I have witnessed thousands of women's lives transformed as a result." "This book offers every woman a tremendous gift of freedom from self-judgment and unrealistic expectations, so she can be free to express her true self, live her heartfelt dreams, and be empowered to make them come true!"